Visit the Greek Isles, and you’ll notice something peculiar about the houses — they’re all made of stone! Naturally, the Greeks don’t have to worry about water damaging their building material, but in the U.S. and many other parts of the world, wood is the material of choice, and its porous nature can lead to warping and rot when exposed to moisture. To avoid these issues and save on the cost of stone, you can treat your building lumber to protect against the elements. This is a standard procedure for any professional construction job and one you can do on your own with a little know-how. Depending on the size of your project and the way you want your finished product to look, you have three options to select from when you waterproof your lumber. For a more natural look, you can apply coats of Linseed or Tung oil, natural oils derived from plants that will create a beautiful warm finish on your wood when mixed with mineral spirits and polyurethane. You can purchase the mixture pre-made to save time. Your second option is to use a more traditional sealant. This method uses varnish and lacquer in place of the natural oil and will not impart the same warm tones to your wood — however, it will offer the most protection. If you’re building an outdoor patio, for example, and need something that will stand up to the elements for years to come, this is your choice. Splitting the difference between the natural oils and sealants, combination stain and sealant products combine a number of components — some water-based and some oil-based — to add color and water protection to your material. These products are best for larger jobs where you need a one-stop solution to treat all your lumber rapidly. Once you select the best method for your application, you can get down to the business of applying your chosen product to untreated timber. Take note that the fasteners used — for example, bolts, ties, and screws — will need to be protected against the elements in their own right. Failing to weather-seal these metal bits can have disastrous consequences, so don’t neglect this part of the job. Sealants and combination stain/sealant products will vary slightly in their application, but most are applied similarly to paint. You can either spray them on or apply them using a brush. Depending on the product, you may need multiple coats to fully treat wood and there may be some finishing work required to remove excess liquid. Working with Tung and Linseed oils is a little more involved. With these products, you’ll need to decide whether to mix your own sealant or purchase a pre-mixed product. Make sure your wood is sanded and cleaned so the oils will take, then apply thin coats of oil to the prepped wood using a natural bristle paintbrush. Remove excess product using rags, but don’t oversaturate your rags because the evaporating oil can cause them to burst into flames — that’s not a joke! Place your spent rags in a safe metal container. Once you’re finished with the application process, you can sand your wood with a fine grit paper and begin another layer as many times as you like to achieve better protection and a deeper finish. This last method is a little more involved, but it will offer the most aesthetically pleasing results for true craftsman-level projects. 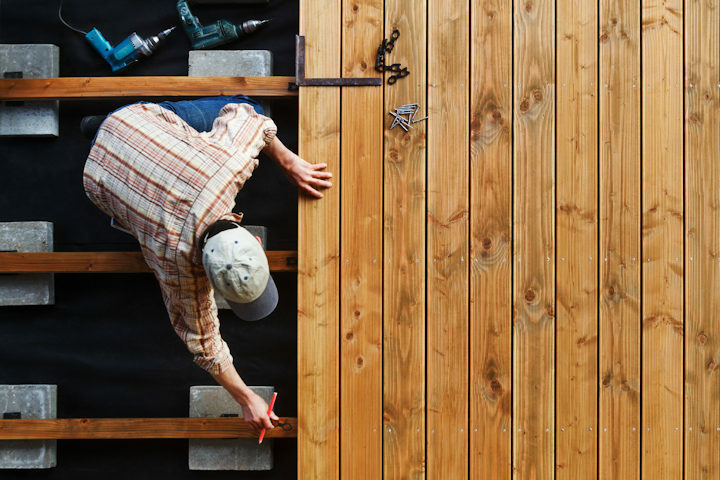 Whichever method you choose, you’ll be glad to know your work is safe from rain and moisture for many years to come, and you’ll have saved a bunch of money by doing the project yourself and taking the proper steps to treat and seal your wood.